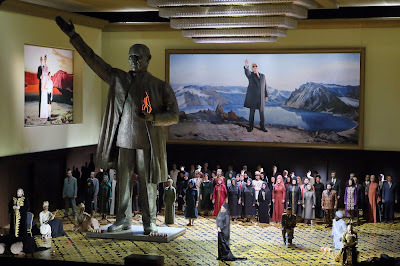 This wasn't my first time with Rossini's Semiramide. 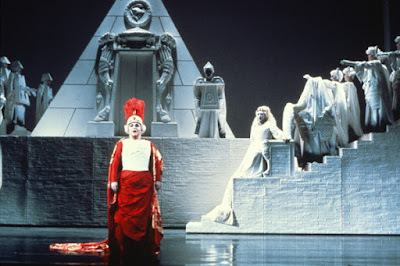 My first time was probably the only time it played at the San Francisco Opera in 1981 with Montserrat Caballé, Marilyn Horne and James Morris. I sat next to a woman who was a Caballé fan, and we alternated sighing for the two female stars. This in spite of the weirdness of the costumes. Richard Bonynge conducted. I bought a film from the Bel Canto Society filmed in 1980 with a very similar cast which included Sam Ramey. The singing is amazing if you'd like to hear it. And then a year ago I watched a stream from Munich starring Joyce DiDonato and Daniela Barcellona which I enjoyed very much for the singing but which was modernized. Let's just say I had certain expectations today. For one thing I expected not to like it. Instead I got surprises. Semiramide is Rossini's last opera seria. It may in fact be the last opera seria at all. 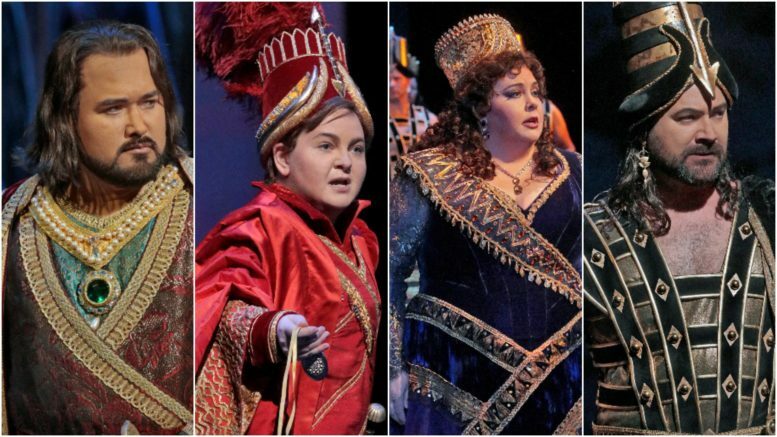 This form of opera means serious opera, has serious subject matter, consists of endless rows of da capo arias and ensembles, and usually has a happy ending. The singing is the point. You can see from the pictures that this is the first time in my experience that any effort was made to make the costumes look Assyrian. In Marilyn's version the soldiers looked a bit like playing cards. In Joyce's everyone seems like modern middle-eastern. Today's costumes may not be pretty, but they are trying to be period. I was genuinely surprised by how much I enjoyed Angela Meade in this role. She has a steelier voice than either Caballé or DiDonato. In fact that could be said of the other singers as well. DeShong is steelier and heavier than Horne or Barcellona. Camarena is heavier than Brownlee or Ariaza. The result is a shift to a much more intense and dramatic work altogether. All are working together to set a tone of intense tragedy. There's only one problem with that: all that intensity can become tedious. Sometimes I appreciated it, and sometimes I didn't. Bonynge and company focused on beautiful singing above all else. This is pleasing in an entirely different way. I was surprised by Ryan Speedo Green. What a voice. I was surprised by the clarity of the plot. I saw the Commendatore from Don Giovanni in Nino's Ghost. I liked it in a surprising way. I felt the same way about today’s performance. Wasn’t sure I was going to like it and Angela Meade. BUT I was totally engrossed. I loved the intensity, the voices, ensembles, the costumes (very colorful). The ending was a little abrupt though. Rather a dull thud. Overall, I would go to the encore on Wednesday if possible. And Yes, Ryan Speedo Green was a treasure. Looking for great things from him. I was prepared not to like it, as I'm not much of a Rossini fan ("too many notes"), and I thought the opera itself was much too long. Two hours for the first act? Seriously? But I thought the singing was generally excellent, and even the comprimario roles were top-notch. [Keep an ear out for Kang Wang] RS Green won the Met Colorado Regionals in 2011, and even back then we could tell he'd be a hit.